Figuring out what to wear in Thailand isn’t rocket science. Bring a few of your favorite lightweight items (your A-game!) and you’ll always have the pieces to create the look you want. And if you need to pick something else up, you can get very affordable clothing at any night market or t-shirt stand in Thailand for a few dollars. I’ve been to Thailand a few times (seven, I think?). I keep coming back to Thailand because it’s affordable, fun, warm, and easy to live, work, and travel there as an American. But the main reason I find myself in Thailand time and time again is because it’s just so diverse. On a single trip you can visit white sandy beaches, tropical rainforests, pristine temples, secluded yoga retreats, and bustling cities with chaotic nightlife. On any budget you can stay in a mix of hostels, tree houses, beach bungalows, 4-star hotels, and even overnight busses (*not recommended btw). 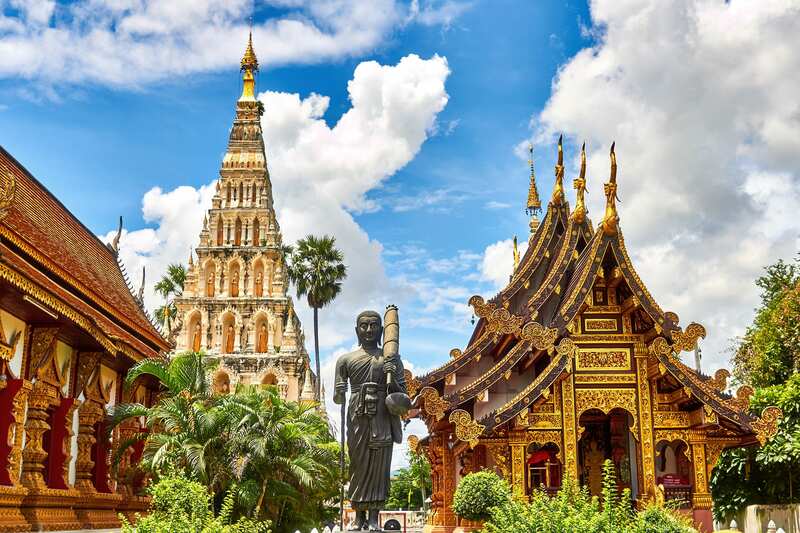 Thailand is a lot of things to a lot of travelers, so planning what to wear means honing in on what works for you and your trip. Ten days in Koh Phi Phi calls for a very different wardrobe than a month of working remotely in Chiang Mai. There’s a lot to see and do in Thailand. It’s important to tailor your wardrobe to you and your trip so you not only look awesome, but also travel more easily. And the best part is that you don’t need to bring a lot to look like you actually belong in Thailand. In fact, it’s the stuff that you don’t wear that will set you apart from the first-time tourist hordes. Here’s what to wear in Thailand without looking like a tourist. I’m really gonna hammer home on this point. Nothing will make you stick out more than a massive backpack—except a huge rolling suitcase. If you’re checking a bag for Thailand I can say with absolute confidence that you’re doing it wrong. You just don’t need that much stuff. A few key pieces will make you look great, feel comfy, and keep you light and limber enough to jump on a tuk tuk and just enjoy your trip. Plus, nothing says “Overcharge me, I’m a tourist!” like a hulking 75L hiking backpack. Stop it. You’re better than that. Keep your wardrobe light and you’ll not only look easy, breezy, beautiful when you arrive at your destination (aka not a hot sweaty mess), but you’ll avoid the “confused camel” look that plagues many rookie backpackers on their first trip to Thailand. Ok, yes, Thailand gets hot and humid. Technically the “cool, dry” season in Thailand is from November to the beginning of April, but it can get sweltering and rainy just about any time of year. (FYI, the monsoon season is May-Oct depending on where you’re headed). And my primary style tip for looking and feeling great in hot humid weather is to dress in light layers. You’re going to sweat in Thailand. A lot. 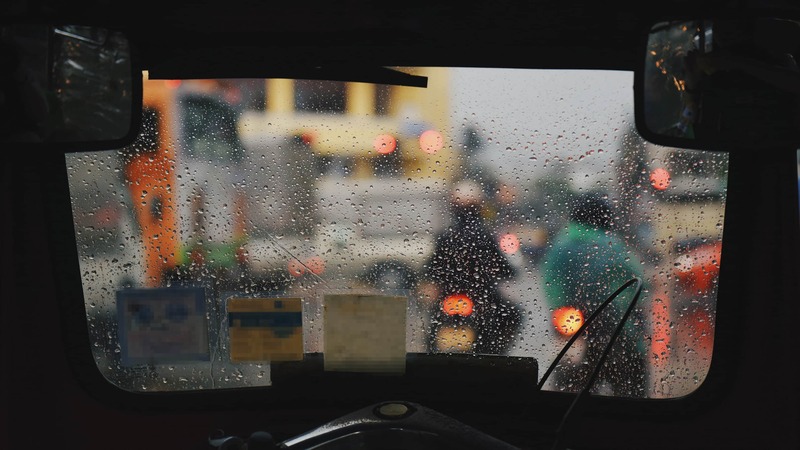 You’ll sweat in busses, walking around temples, sitting quietly and drinking a coffee. That’s why I pack a few merino t-shirts that I really like, as well as a couple of tank tops, and one stylish button up long sleeve shirt. When you wear light layers (like a merino tank top under a t-shirt or long sleeve) you keep the sweat and stink confined to one shirt. If it gets super hot you wear the tank top. When it’s nicer, chuck a t-shirt on top. Wearing multiple shirts (tank + t-shirt or t-shirt + long sleeve) lets you wear all of your shirts multiple times, stretching your wardrobe options and the time between washes, especially if you can afford merino shirts. Day bags or even fanny packs (they’re back!) 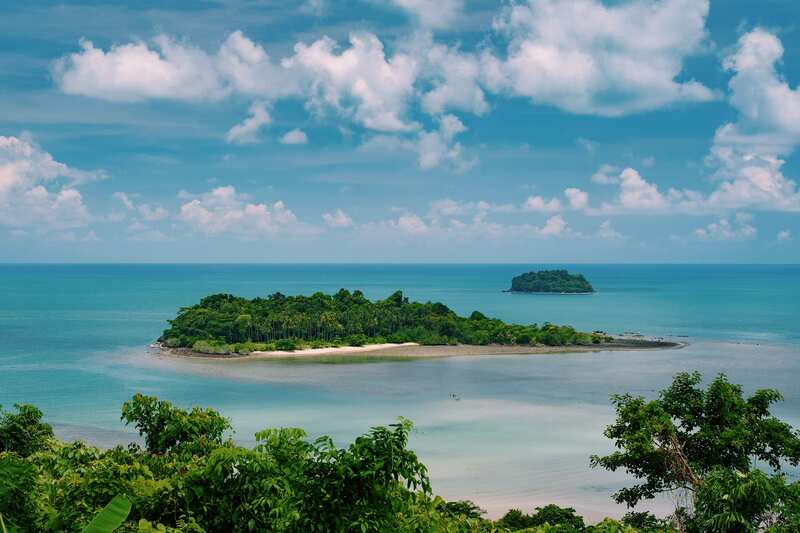 are an absolute must in Thailand, since you’ll likely be exploring ancient ruins and coffee houses with equal abandon. A light stylish cover up layer or long sleeve for does triple duty for sun protection, air-conditioned cafes, and protection from mosquitoes around dusk (more on that in a second). 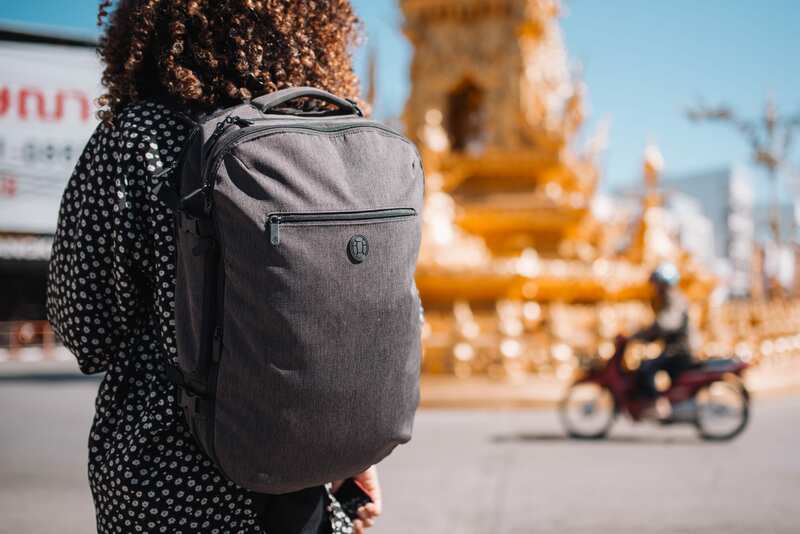 You will live out of your daypack in Thailand, so make sure it’s one that fits your style, you actually like, and you want to use all the time. Outside of Bangkok, Thailand can be surprisingly modest, especially for first-time visitors. And nowhere is that more apparent than at one of the dozens of beautiful temples around Thailand. You should see at least a few of these temples, but to get in the door you need to wear the right clothing. Short shorts: Honestly, anything above the knee can be a problem, and some temples frown on shorts in general) — Wear pants instead. Clothing with obvious rips or tears: (even if you paid a lot for that look). Tank tops: Wear a t-shirt at the very least, you knucklehead. Basketball shorts or jerseys: Really any kind of sportswear is a no-no. Sweatpants: C’mon. You’re better than that. Short skirts and short shorts: Even shortened trousers are a big problem at many temples. Skirts below the knee are usually ok though, but the longer, the better. Leggings: Yoga pants and stretchy workout tights and clothing—even really slim jeggings are not usually acceptable. Remember that outside of Bangkok, Thailand is a very modest country. Tank tops and uncovered shoulders and arms: You might get away with a pashmina or wrap/cover up, but don’t count on it. Just wear a t-shirt and you’ll be fine. Sandals are fine almost all the time, because that’s what people wear in Thailand. So don’t sweat the footwear. Just make sure you look presentable and your arms are covered. It’s a lower bar than you think. Please do your best to clear it. Fun fact: I got dengue fever (a mosquito-borne illness) when I was rock climbing in southern Thailand a few years ago. It was super cool. The reason I bring this up in a style guide is because staying alive is the most important part of your trip to Thailand, and the clothing you bring can actually help avoid dangerous mosquito bites (in conjunction with malaria medication, insect repellant, and mosquito nets). Mosquito-borne illnesses aren’t super duper common in Thailand, so don’t freak out. But you should be aware of them and how to protect yourself against the risks. And one of those is by covering up, especially around dusk. Most of the really nasty mosquitos come out around sunset—when you’re trying to look your most instagrammable—so it’s important to pack at least one stylish long-sleeve shirt—that you actually want to wear. It sounds stupid, but if you pack a “travel” shirt that looks dumb or doesn’t fit, you’re not going to wear it around the bonfire when you’re sipping on a Tiger (that’s a beer). Linen is a popular choice, but linen wrinkles pretty easily and doesn’t travel super well (which means you probably won’t wear it as much as you should). I like to wear a nice breathable long sleeve henley shirt, like the Go-To Henley from Public Rec. It’s stretchy, breathes like a champ, fits really well, and hey—I like wearing it which means I’m that much more protected from the mozzies. Shorts and skirts are also the obvious choice for Thailand, but it’s important to add at least one pair of lightweight, comfy travel pants for late nights (some, but not tons of clubs require pants) and mozzie protection. I dig the Outlier Slim Dungarees since they make a great pair of stretchy pants for chilly airplane rides and double as a good pair of everything travel pants—from rock climbing and riding a bike, to hopping on a scooter and zipping up the road to Pai. Ladies, try prAna Women’s Regular Inseam Halle Pant. The peak season for traveling to Thailand is the late fall and winter—basically November to March. “Winter” in Thailand is their cool, dry season, but it’s still pretty danged warm. Guys, plan two pairs of shorts that each double as a swimsuit, since you never really know when you’re going to jump in the ocean/pool/hot tub/lake/river. Grab a pair of hybrid shorts that dry quickly (so you can pack them when you’re on the go), and make sure you have reliable pockets—aka something with a zipper or at least velcro. Ladies, either shorts or skirts will do. A hybrid skort goes a long way toward covering all of the bases, from hikes to sunset bar drinks, with a temple in between. If you’re going to spend any time on the Kohs, plan two swimsuits; you’ll wear them both. Choose bottoms with pockets because you will need a place to store coins and (probably wet) baht. Extra points for pockets that zip. As far as tops, Thailand is remarkably forgiving when it comes to fashion choices. You’ll see burnouts and hippies wearing hand-dyed hemp “shirts” next to fashionable professionals in collared shirts and polos, and sunburned beach bros in “authentic” fluorescent Thai tank tops. (Don’t be one of these guys). You’ll also see more and more digital nomads in Thailand rocking the unofficial travel uniform of a dark colored merino t-shirt. Whatever you choose, remember to bring at least one or two shirts that cover your shoulders for temples and some nightlife spots. Merino t-shirts look great, don’t smell (even when you do), dry quickly, and travel like champs. A nice fitting merino t-shirt makes you look like you belong on a Bangkok rooftop, or at a banging beach party. Guaranteed. But if you’re really looking for that extra pizzazz, toss in a short sleeve Riviera Bonobo button down shirt. They’re super lightweight, relatively wrinkle-free, and stylish as all heck. I also think a comfy henley shirt—both short and long sleeve options—perform beautifully in the heat while still looking great. Ladies, you might want to substitute one of your merino shirt layers for a light weight, flowy blouse. Something that goes from day to night and still looks great with your long sleeved layer. Throw in a classic little black travel dress and you’ll truly be prepared for anything. But remember not to overdo it. One “nice” outfit will last your whole trip, since you’ll probably never see any of these people again. For shoes, I actually don’t like wearing sandals all that much (I know). I instead usually opt for a pair of AllBirds Wool Runners and a pair of Toms. The AllBirds are great for exploring the city or taking a hike, and the Toms work as my everyday “beach” shoe for sandy destinations, shuffling around the hostel, or just chucking on a pair of shoes to head out for a quick bite. I found that the wool AllBirds are insanely comfortable—even in the Thai heat—and I can wear them without socks, which is a game-changer for me. I actually wore the wool AllBirds for 10 days straight in the Caribbean, without socks, and they still smell (and feel) awesome. If you’re looking for a pair of shoes that can handle a little more rugged terrain while still looking normal in town, check out the Scarpa Approach Shoes. I love these things. They’ve taken me hundreds of miles on trails all over Spain, and yet still look good enough to wear to business meetings in Manhattan. Plus, they’re lightweight so you can actually pack them in your backpack when you don’t feel like gearing up. The same rules apply for island hopping in Thailand. Bring a few key pieces of lightweight breathable clothing and swap them out regularly. Merino shirts, merino underwear, hybrid shorts (that can handle a swim), and a stylish long-sleeve shirt or beach cover up. Ladies, two swimsuits and a cover-up that will let you sit down at a beachside restaurant, at least one breezy dress, a shorts/skirt and blouse combo that makes the switch from adventure to evening is all that you need. For nighttime partying, keep it simple. A nice pair of travel pants goes a long way to making the rest of your clothing look a lot fancier than it is. Gals, glam up your day time dress with a scarf and accessories, add your long sleeve layer, and hit the party. And make sure to bring at least one pair of closed toe shoes. You’ll be glad you did. Thailand has intense monsoons from May to October. If that’s when you’re headed to Thailand, rain will just be part of your daily life. But a little torrential downpour doesn’t mean you can’t look awesome. A slick outer shell rain jacket is a crucial wardrobe item. Rather than choosing the dorky one that folds into a pocket at REI, choose something a little more stylish, like the rain jackets by pRana, Patagonia, or (if your budget allows it) Arc’teryx or Helly Hasen. A pair of shoes that can dry quickly are also a fashion must have for monsoon in Thailand. Don’t be the guy squishing through the Central Festival. I prefer the Xero Shoes since they’re lightweight, have excellent grip (so you don’t slip on anything), and dry really quickly. Plus, you can roll them up in your bag when you don’t want to wear them, which is kind of amazing. If you’re one of the thousands of remote working travelers headed to Chiang Mai or Bangkok to live that freelance life, you’re still gonna want to look the part with clothes that scream, “This IS my real job, Dad.” Here’s what to pack for working remotely from Thailand. I always pack a merino, or performance short sleeve henley shirt. Henley shirts are comfy, but still look sharp, thanks to those buttons. They’re just professional enough to handle that skype conference call with a client, but you won’t feel out of place at the night market. Ladies, pack at least one blouse that screams, “Lady boss!” to wear for meetings and the evening shmoozing meet ups of the digital nomad crowd. Business casual is all you need. Everyone focuses on the shorts you should wear in Thailand, and that’s cool, but I think your choice of pants is even more crucial. Especially since I think you should only take one pair of travel pants with you. As mentioned above, travel pants are great for chilly bus rides (when the AC is blasting), but also ideal for keeping your passport and wallet safe and secure on those sweaty bus rides (when the AC is broken). I wear my travel pants to cafes and co-working spaces, but also to the beach at night if we head to town (cuffed at the ankle of course). A great pair of travel pants is more important than travel shorts simply because when you need them, you need them. And sometimes in Thailand, you just have to wear pants. Top that off with a stylish pair of Toms or AllBirds and you’re looking sharp. Packing for Thailand isn’t rocket science. Bring a few of your favorite lightweight items (your A-game!) and you’ll always have the pieces to create the look you want. And, if you need to pick something else up, you can get very affordable clothing at any night market or t-shirt stand in Thailand for a few dollars. You’re always going to look a little like a tourist in Thailand, but with the right outfit you can look like you’ve done this “travel” thing once or twice. And that’s really what it’s all about. Thailand is always hot and humid: Pack enough lightweight clothing to layer and change regularly. Tank tops are awesome: But don’t make them the only thing you wear. Bring at least one pair of pants and a long sleeve shirt. Cover up when you visit Thai temples: Upper arms, shoulders, and knees should be out of sight. Less is more: The best thing to pack for Thailand is less. Get weekly gear reviews, travel hacks, and packing tips sent straight to your inbox. As an added bonus, we’ll send you a carry on packing list right away.